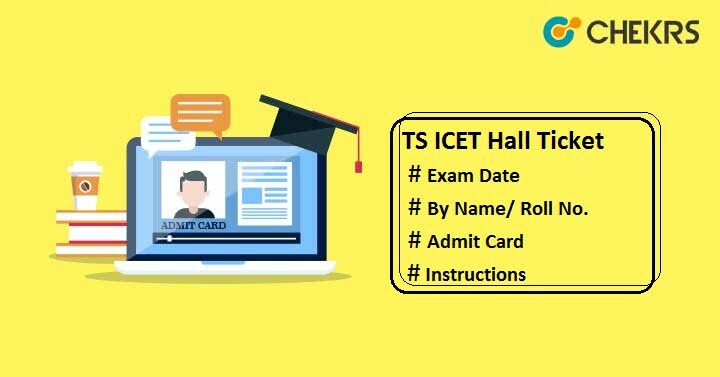 TS ICET Hall Ticket Download 2019: Telangana state Integrated Common Entrance Test (TS ICET) is an entrance test which offers admission to MBA & MCA programmes in Telangana state colleges or institutes. Aspirants who want to pursue MBA or MCA can register themselves for TS ICET 2019. Candidates who will submit the application form in a successful way, they will be able to download their TS ICET Admit Card in online mode from the official site. The admit card is a very necessary document to be produced to the examination center during the exam. Candidates thinking to appear in this exam need to check TS ICET 2019 Exam Date so that they do not miss the chance. Click on “Download HallTicket” option in Application section. Enter Registration Number, Date of Birth & Qualifying Examination Hall Ticket No and click on “Download Hallticket” tab. The “TS ICET 2019 Hall Ticket” will display on the screen. The authority will release the admit card of all candidates on the official web portal of TSCHE. The hard copy of Telangana ICET Hall Ticket will not be sent to any candidate via post or any other mode. Candidates will have to carry the print out of their admit card with them on the day of exam. Other required document to be brought to the examination center is valid Photo ID (Aadhaar card, Voter ID card, Driving License, PAN card). Students are advised to go through the guidelines printed on the admit card and adhere them. Keep your hall ticket safe till the completion of admission. You can leave your message in case of any kind of doubts. We will respond back to you soon. Stay tuned with our site for more updates.